Vancouver Design Week is a city-wide platform, invitation and call to action. A chance to spotlight design innovation, to connect designers across disciplines, and to celebrate and empower the design talent shaping our future. This year, VDW will focus on the impact that design has on our lives and how it can be a powerful tool to make the world a better place. This is VDW’s third edition now, but the first to have it’s own theme. By setting a theme the team hopes to create the opportunity for each of us to look at design through a different lens, deepening our understanding of design and its presence in our everyday lives. Some of the questions being asked by the VDW team this year will help get you thinking about what this all means and how it applies to you. How are designers impacting our city and our world? What positive change are they creating in our communities? Why is design critical to solving social and environmental problems? Vancouver Design Week will be taking place all over Vancouver with happenings including studio openings, tours, talks, workshops, tastings, and special VDW Editions of regular events. It’s sure to be an exciting week! If you’re interested in finding out more or getting involved, check out the VDW website, or social channels on Facebook, Instagram, and Twitter. VDW’s mission is to increase awareness of and appreciation for design, design process and the pervasive impact design has on important social and cultural issues; and to create an informed, inclusive (and inspiring!) participatory platform for engaging them. So as an industry partner this year, Joda Creative has been assisting in the digital strategy, content creation and social media marketing side of things to help drive awareness, engagement and interest around this year’s theme and events. The more we can contribute and accomplish this year, the more momentum we can bring into following years as well, and ultimately continue to build upon this foundation. Truthfully, before getting involved with VDW I didn’t realize or fully appreciate the extent to which design plays a role in each of our lives. Sure, as a digital and creative agency of course design questions, ideas and challenges pop up every single day, but even as individuals we are all impacted by design more than many of us notice. It’s that very concept that has us so excited to be a part of this movement in Vancouver. I’ve come to learn and appreciate design more than ever through this partnership, and my team and I are very grateful for the opportunity. 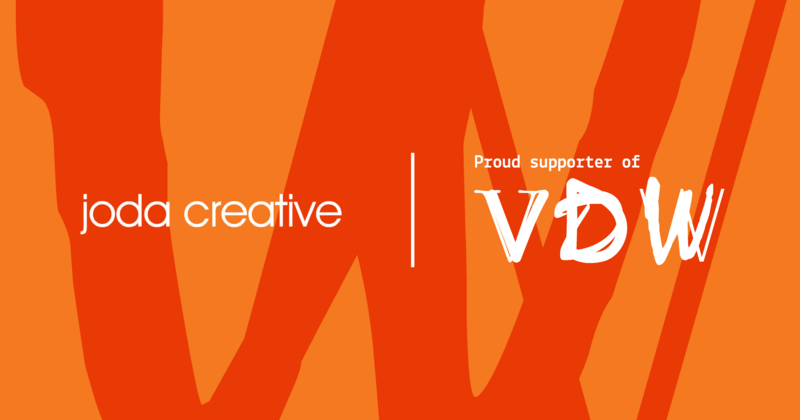 The whole team at VDW has been amazing to work with, and we can’t wait for the events to start unfolding around the city on May 7th!